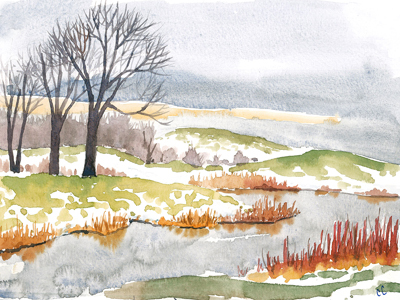 Melting Snow at Crabapple Lake Watercolor – Let's Paint Nature! But only the hilltops relented, exposing green of grass. Did remaining snow call in clouds for help? The day before Thanksgiving my workplace closed early, giving me the opportunity to steal some sketch time. I’m taking it. It’s rare. Sitting in the car looking at this gorgeous view, I had to capture this very moment before it is lost forever. With the radio off and the precious silence of nature, I have to fight down worry creeping in the back of my mind. My home is host to out of town relatives and tomorrow is a big day with big duties, entertaining, and commotion. I have to literally quiet my mind to be able to paint. It’s a tug of war honestly and I wonder if that is why many people feel so uncomfortable with silence….it forces you to deal with the problems in your head. Silence demands attention. Worry demands attention too. But what is worry? This morning on the way to work, I was listening to an interview with Steve DeWitt (Pastor of several churches in Indiana) on anxiety. He said that when his child was a baby, she had a specific pattern when she was upset. First, she would flail her arms, hit her leg, then let out a big cry. He would always tend to her needs whether it be change her diapers, feed her, or the like….then he said something really interesting… He had this tremendous urge to somehow let her know that all of her needs are already met. He had cases of diapers in the basement, food ready and waiting, warmth, clothing, available. Then he posed this question: Are we like this with God? Do we flail our arms and work ourselves up? God has supplied all of our needs already. He sent His Son to take our punishment and make a way for us. Once we repent and accept this, we become heirs of God. If you can take a step back for a second and contemplate what this means, it will fill your heart with abundant joy in the midst of struggle. You have eternity with God. Not only has He overcome the world, but He wants to meet your needs right now. As a child of God, you can go to Him for your needs and not worry. There are hundreds of verses in the bible lovingly telling us to “fear not”. So friends with that, hang in there, don’t give up. You are loved and will be taken care of. Fear not. Put your trust in Jesus, and you too can overcome. Reread this every time you need to remind yourself. Thanks so much for your post, your notes of encouragement along the scriptural readings give peace to my heart. As I gazed upon your watercolor, I noticed the trees and thought, “wow” that looks like a sketch that I did years ago in college when I had the privilege of taking a watercolor class. That class gave me peace and joy amidst the rigors and demands of college life. That is so cool! I’m glad the painting brought back fond memories. Thank you for your kind words, Holly! A painting like this brings the world into focus … not because of what it shows … or how … but by the way it makes one feel … and I feel great! Thank you. Thank you for those words, Gene! My goal is to convey a feeling. So glad it resonated. What an affirmation from God to read the exact same verse John 16:33 which He inspired me for my recent post. Thank you and God bless you! Thanks, Nancy! Yes, oh how fortunate we are to have mercies renewed every morning! Praise God. Nice scene. It is hard to find the quiet and “letting” oneself play in this busy season. So true! Wishing you many stolen minutes of peace and play time in the midst of busyness! I really enjoy looking at all your paintings and am always amazed at how you make something so technically complex appear so easily and effortlessly done. Your spiritually definitely flows into to your art. Thank you, Larry! Your words mean a lot and encourage me much. Beautiful thoughts! Thank you for sharing what God was putting on your heart. Your sketch is wonderful as well. I hope the time with your guests went well and you were able to have moments of calm here and there. Thanks! The holiday went well. Glad they’re over. ha ha. Now it’s back to work…play work that is…painting! Sending you wishes for a tranquil year.